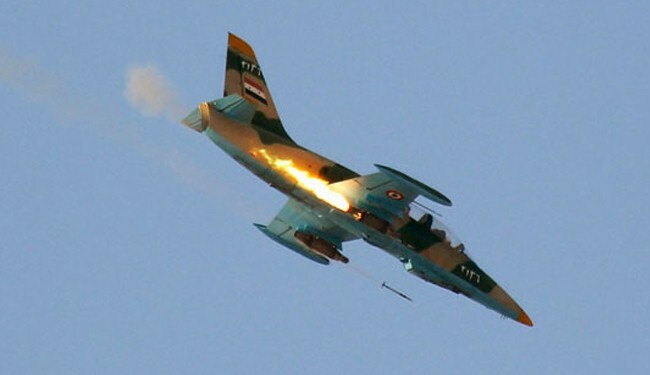 JNN 17 June 2014 Baghdad : More than 350 ISIL terrorists have been killed in airstrikes in the western province of al-Anbar, the Iraqi army’s regional operations command says. Warplanes attacked the Terrorists of the so-called Islamic State of Iraq and the Levant as they appeared to be parading near Fallujah, a city that has been under the control of the terrorists since January. One of the ISIL leaders, identified as Yasser Nayi, was among those killed in the airstrike, the army said. About 400 Terrorists hid in a four-story building in Fallujah when they saw the warplanes approaching, an army commander in the city told the official Iraquiya network. Military aircraft fired rockets and machine guns at the building, killing about 270 Wahabi Terrorists and destroying seven vehicles, officials said. Airstrikes also killed about 70 Terrorists in the city of Samarra and 17 others in Baquba, the capital of Diyala province, state television reported. A total of 56 terrorists were killed in a series of operations in Baghdad in the past 24 hours, the armed forces said. The army killed 279 Terrorists over the weekend in fighting in Saladin, Diyala and Nineveh provinces, armed forces spokesman Maj. Gen. Qassim Atta said on Sunday. The ISIL terrorists are holding Mosul, Iraq’s second-largest city and the capital of Nineveh, and threatening to advance on Baghdad. Syria’s army has been pounding major bases of the so-called Islamic State of Iraq and the Levant (ISIL) in coordination with the Iraqi government in the past 24 hours. The strikes against the ISIL terrorists have been more intense than ever, said the Britain-based Syrian Observatory for Human Rights on Sunday. “The Syrian air force has been pounding ISIL’s bases, including those in the northern province of Raqqa and Hasakeh in the northeast,” which borders Iraq, said the group, which is tied to anti-Damascus opposition groups outside the country. In Raqqa, the air force bombed the area surrounding ISIL’s main headquarters in Syria, as well as the group’s so-called religious courts, said the Observatory, adding there were no reported casualties. Photographs sent by an opposition group in Raqqa that could not be independently verified showed craters in the ground and rubble in front of the main gates of the headquarters, a former town hall. This is while on Saturday, the Syrian army also bombarded ISIL’s headquarters at Shaddadi in Hasakeh, home to a frontier crossing from Iraq that is under the terrorists’ control. The government in Baghdad has been gearing up for a counter-offensive against ISIL in areas where it and other Wahabi Terrorists have presence in northern Iraq. ISIL has the same Wahabi Ideology which they call Islam , and has in mind an ambitious plot to set up a state stretching across the Syria- Iraq border. It has been accused of committing widespread human rights abuses in Syria. In 2013, it took part in operations against Syrian forces. But in recent months, it has exclusively fought against rival Syrian insurgents. A war pitting Syrian Terrorists against ISIL has killed more than 6,000 people, mostly insurgents, since it broke out in January. Hundreds of Wahabi Terrorists, including the Terrorists linked to the Islamic State in Iraq and Levant (ISIL), an al-Qaida offshoot, attacked the western suburbs of the provincial capital city of Baquba, some 65 km northeast of Baghdad, and clashed fiercely with the security forces, Major General Jamil al-Shimary, Diyala’s provincial police chief told Xinhua. The clashes erupted late on Monday night when insurgent groups attacked a police station and another military base in al-Mafraq area in western Baquba, leaving nine Wahabi Terrorists and two policemen killed, along with wounding six policemen, Shimary said. Separately, seven insurgents were killed in clashes between insurgent groups and the security forces in the city of Maqdadiyah, some 40 km northeast of Baquba, according to Lieutenant General Abdul Amir al-Zaidi, Commander of Dijla Operations Command responsible for security of Diyala province. The troops also killed 12 terorrists in battles on the edges of the city of Udheim, some 60 km north of Baquba, al-Zaidi told reporters. Diyala province, which stretches from eastern edges of Baghdad to the Iranian border, has long been the stronghold of al-Qaida militant groups and hotbed of insurgency and sectarian violence since the U.S.-led invasion broke out in 2003. The security deterioration in Iraq started last week when bloody clashes broke out between the Iraqi security forces and hundreds of gunmen who took control of several neighborhoods in western part of Mosul and expanded later to other areas and provinces after the Iraqi security forces withdrew from the city. Takfiri militants in Iraq have attacked the convoy of a senior Shia cleric near the capital Baghdad, killing eight of his guards. Sheikh Sami al-Massudi said on Saturday that his convoy came under attack near Ishaqi, located in the north of the capital. The attack sparked clashes, which took hours to end and injured 10 other bodyguards as well. Massudi said the convoy was on its way to the holy city of Samarra, “but we were surprised by a fierce battle near Ishaqi,” recently retaken from militants. The militants, who were hiding in farmland next to the road, launched an attack against the convoy with machineguns and sniper rifles, Massudi said, adding that the clashes continued from morning into the afternoon. “I cannot say if I was the target,” Massudi stated. On June 10, the militants of the al-Qaeda splinter Islamic State of Iraq and the Levant (ISIL) took control of Nineveh provincial capital Mosul, in a lightning advance, which followed the fall of Tikrit, located 140 kilometers (87 miles) northwest of the capital Baghdad. Hundreds of thousands of people have been forced out of their homes since the time. This entry was posted in Middle East and tagged Baghdad, Iraq, Iraqi Forces, ISIL, Islamic State of Iraq, Karbala, Mosul, Nineveh, Syrian Forces, Terrorists. Bookmark the permalink.